September 13, 2018 –Pensacola Beach, Fl—The Gentle Giants of Northwest Florida Great Dane Rescue (NWFLGDR) are back to take over Seville Square in downtown Pensacola on Saturday, Oct. 6, from 10 a.m. to 4 p.m. for the third annual DaneToberfest celebration and fundraising event. This year’s festival theme is “It’s Raining Danes.” Around two dozen adoptable Great Danes of all ages and colors will be on site to greet festivalgoers — and happily receive treats and affection in return (hint hint). This year’s event will feature more than a dozen vendors selling arts and crafts – everything from handmade crafts to pet products to scented-candles and soaps. In addition, there will be three food vendors on site: Hip Pocket Deli Food Truck, Lone Star Kitchens 2 Go, and Kona Ice. In addition to the major prizes, more than 50 other items will be raffled off throughout the day – including custom artwork, gift baskets, gift cards and collectibles. The goal for this event is to bring attention to the many incredible Danes currently available for adoption within the rescue; to emphasize the importance of spaying and neutering pets; to increase awareness about the benefits of adopting and fostering in your community; and to help raise $8,000 for the rescue to be used for veterinary expenses, medical supplies, food and general care expenses. NWFLGDR relies entirely on public donations to exist. The rescue spends anywhere between $300 to $1,000, and occasionally much more, to care for each Great Dane it takes in. That includes medical treatments, food, preventatives and medication, microchip and spay/neuter surgery, but does not take into account the amount of personal time and energy it takes every foster to nurse each Dane back to health and acclimate it to a caring environment. 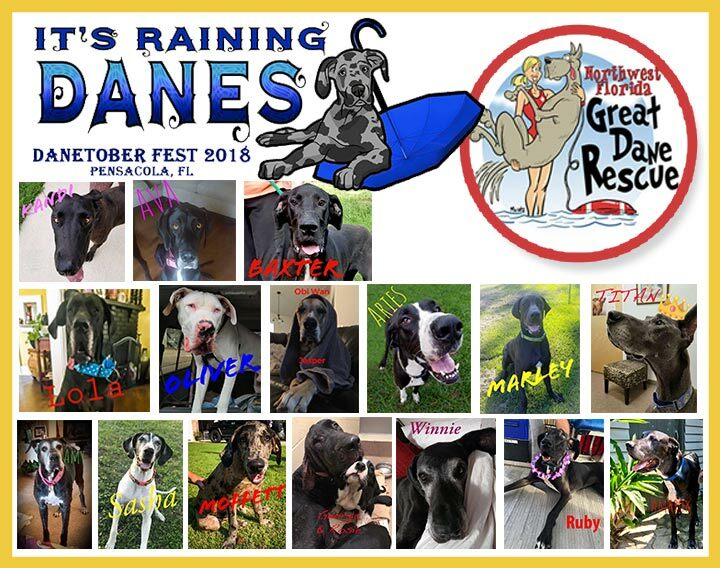 NWFLGDR hopes DaneToberfest will become a long-standing annual event in the Pensacola community where the public can come out and support the rescue’s cause and where prospective dog owners or prospective fosters can meet and learn more about the breed and dane ownership in general. DaneToberfest 2018 is a DOG-FRIENDLY event. That’s right, bring Fido along! We just ask that all dogs be well behaved and up-to-date on vaccinations. No retractable leashes, please. Northwest Florida Great Dane Rescue was founded in Pensacola, Fla., and became a 501(c)3 nonprofit organization in 2008. NWFLGDR serves a large coverage area — from Jacksonville, Fla., westward along the I-10 corridor through southern Georgia and along the Gulf Coast of Florida, Alabama, Mississippi and into New Orleans, Louisiana. All Danes are brought current on vaccinations, microchipped, spayed or neutered, and heartworm tested prior to adoption. For more information about Northwest Florida Great Dane Rescue or DaneTobefest, message us on Facebook at www.facebook.com/NWFLGDR or email NWFLGDR@gmail.com.